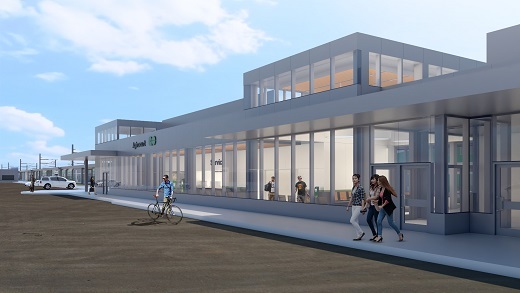 Major improvements are underway at Agincourt GO Station. We're updating amenities, enhancing accessibility and making it easier and more convenient to access GO services. The south half of the platform has been demolished and we will start platform renovations in the spring. We've dug under the tracks and installed the concrete shell of your new south tunnel. We are now working inside the tunnel to connect electricity and other utilities. Support beams for your new station building have been installed. We're in the process of connecting underground utilities (electricity, gas, water, and cable) that will be needed for your new station building. Soon you will start to see the exterior of your new station building start to take shape. Please remember to give yourself extra time to get to where you’re going. Don’t forget that construction and station improvements are also underway at neighbouring GO stations: Milliken and Unionville. to ensure you’re sitting in the correct car for your stop. Listen to the announcements on your train. Not all cars will open their doors. If you are unsure, feel free to ask your customer service ambassador for assistance. Look for signage to show you where to stand and remember to spread out along the platform. As work progresses, you can expect additional changes to the parking lot layout. However, the current number of parking spaces will always remain as we work to improve your station. When the south side of the platform work is complete and the first tunnel and elevator are installed, we switch our work to the north side of the station. This means door restrictions will also change. Updated February 28, 2019 | All renderings are subject to change.